We all know Lily B, our amazing presenter for Zathu Pa Wailesi. A skilled and exciting presenter who has been with the show since inception in April. After enjoying a good time at Zathu Pa Wailesi Family, Lily B has decided to move on with life and pursues some of her other dreams. This is a very important step in her career, we fully support Lily as she takes the next step and encourage you - our fans - to see Lily as a role model; someone who has worked hard to achieve her goals and succeeding in her career. Now that Lily B is gone, we are so excited to introduce a new co-presenter, C-Zee, who is joining Goxy in hosting Zathu Pa Wailesi. C-Zee is a hugely talented young presenter, who you might have seen on TV and radio shows such as Fresh on Zodiak or Born and Bread on MBC Radio 2. 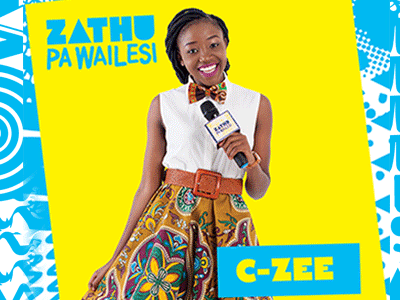 C-Zee is guaranteed to bring more fun and adventure as we move into season 2 of Zathu Pa Wailesi.